Now Available on CD from Fewer Sorrows Music! Song samples are posted on our Audio page. 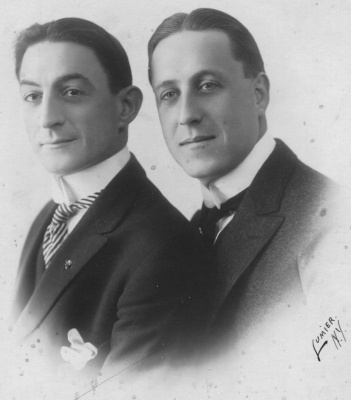 performed as it was composed and played over 100 years ago. 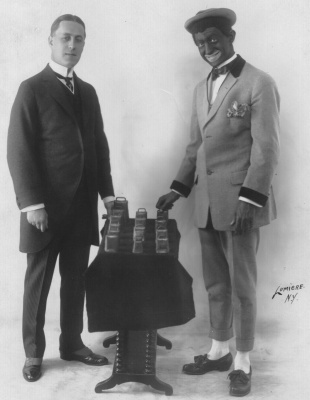 Contact us to inquire or order the Vaudeville CD. 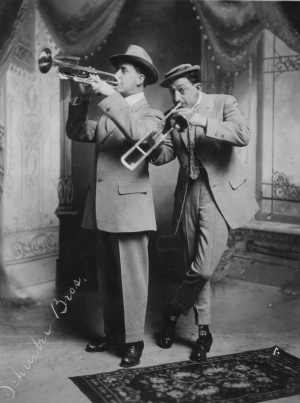 Will Schreiber (with trombone, bassoon) & Fred Schreiber (trumpet, violin), around 1910. Guess which one was the straight man. 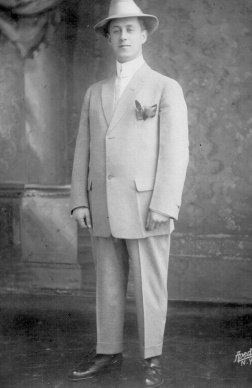 William Henry Schreiber (1882-1964) was my great uncle (see below). 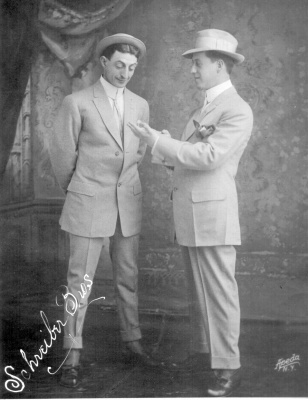 He and his brother Fred Schreiber (1885-?) 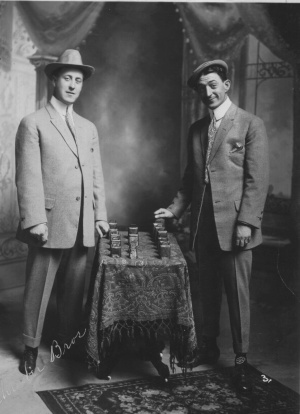 were a musical comedy Vaudeville team around 1905-1915, playing on stages (the "Orpheum Circuit") and cruise ships all over the U.S., in the Caribbean and, legend has it, in London. After they stopped touring, Will came to Meridian, Mississippi, where he met and married Carrie Netter and moved to Albuquerque, New Mexico. Will and Carrie raised my mother, Lucile, from an early age. 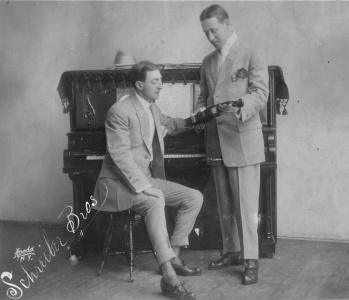 During the 1920s and 1930s, Will played the organ and piano for silent movies in Albuquerque's Sunshine Theatre and led dance bands, among other, less musical jobs, and Carrie ran a flower shop. 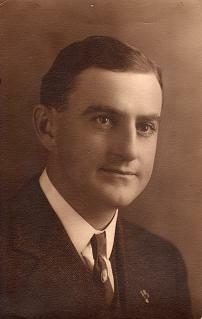 After Lucile completed college and got married, he and Carrie moved back to Meridian, where he worked for a time with Carrie's brother, Daniel Netter, in the latter's candy business and operated a service station. Sometime during the 1950s, they came to live near our family in Amarillo, Texas. Carrie died there in 1961. 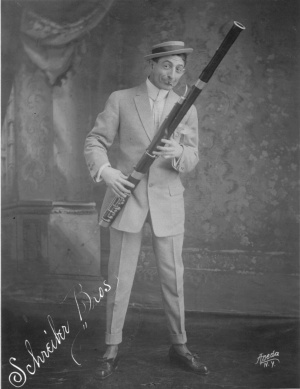 Will, still a fine musician but rarely choosing to play, briefly lived with Lucile in Amarillo and Oklahoma City, tried to return to Meridian, and finally died in 1964 in the B'Nai B'rith Home in Memphis, TN. During the 1990s, I discovered a large box of Will's musical memorabilia among my mother's possessions. 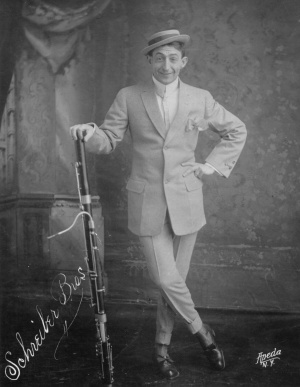 In it were a number of old professional pubicity photos, sheet music for several published songs (many written by Will with lyricist and Albuquerque impresario Joseph R. Scotti, a close friend who help him when times were tough, or Dolores Otero de Burg), small bits of musical scores for half a dozen more songs and operettas, notes & lyrics written on scraps of paper, and a comedy routine script written for the Schreiber Brothers by a New York writer. I asked Jim Kerkhoff, an Austin composer, pianist, and then head of sound design for the University of Texas performing arts, to synthesize a MIDI version of some of Will's songs as they might have sounded early in the 20th Century. He produced a beautiful tape with six of the songs; those files are being re-mastered and placed on a CD which can be purchased by sending us an email here.. 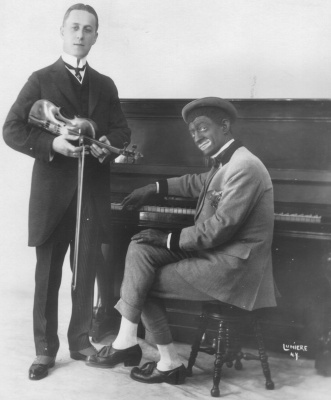 NOTE: Some of the poses below are in blackface, common during the Vaudeville period. If that historical fact interferes with your appreciation of musical history, you should re-examine your sense of political correctness.